This Entertainment Center, reflecting the Shaker styling, is shown in heavily figured flaming red birch. The dimensions are 60" wide, 54" high, and 24" deep. The double doors on the right are designed to house a TV with up to a 35" screen, and it is available with or without a pull out shelf. 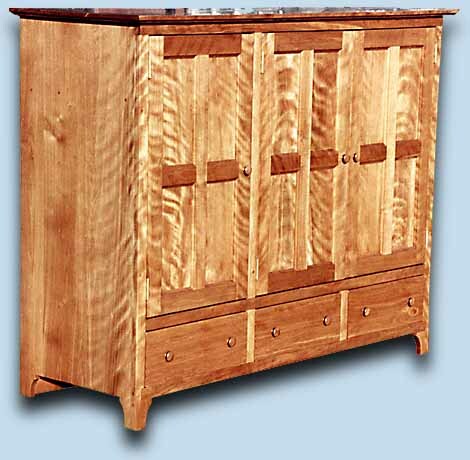 This piece is constructed of 100% solid wood, and features dovetail drawers, with flat or raised panel doors. While shown in birch, it is also available in birds eye or curly maple, and flame cherry. As each piece is all handcrafted, dimensions, color, and hardware may be altered to suit.